Today’s #TipTuesday is an oldie but a goodie: Advanced Lookups. These have been around as long as I can remember, but they are one of those hidden things in Dynamics GP that many users don’t realize exists. 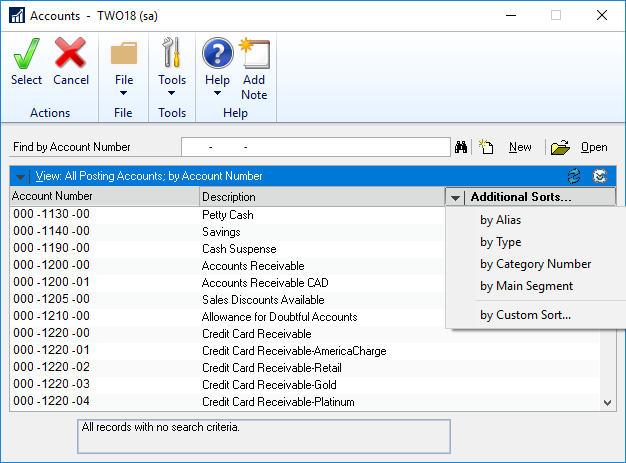 For selected Lookup windows in Dynamics GP, Advanced Lookups will add extra sorting and lookup options, up to 4 additional fields for a user to access quickly without needing to go into Custom Sort. 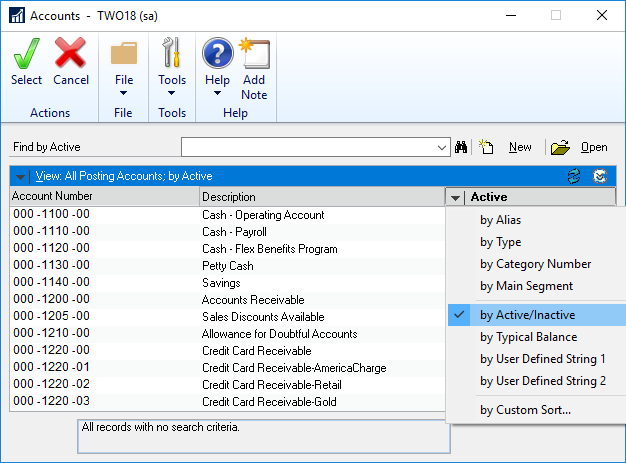 Here is the out of the box Accounts Lookup window (GL Accounts). Under Additional Sorts, there are 4 options: by Alias, Type, Category Number and Main Segment. The bottom option, by Custom Sort, opens an additional window where a user can select any other available related field to sort by, but it’s one-time-only, for that lookup. The setup is located under the Administration navigation pane > Setup pane > Company > Advanced Lookups. Yes, this is company specific, which can be good or bad depending on whether you really want every company to have the same lookups! The setup itself is simple: select which Lookup window you want to alter, and select up to 4 fields. The Description is editable, but will default to “by” and the name of the field chosen. As an example here, I changed “Active” to “Active/Inactive” as an example. User Defined fields are a good place where you may want to put a more meaningful name in. 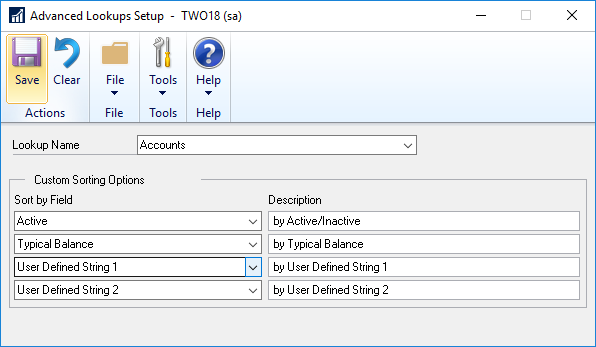 Even in places where User Defined fields have been renamed in a Setup window (like Customer user defined in Receivables Setup), the Advanced Lookup window will still show the field name as “User Defined 1”. Next time you open a lookup window after saving this, the changes will be visible. Each company can have 1 advanced lookup setup per Lookup window above. What I like about this is in situations where users are often looking things up by fields other than the default sort options, it’s a super easy tweak to make the field that much more reachable and useful.